Flavius Julius Constantius Augustus was Roman Emperor from 337 to 361. 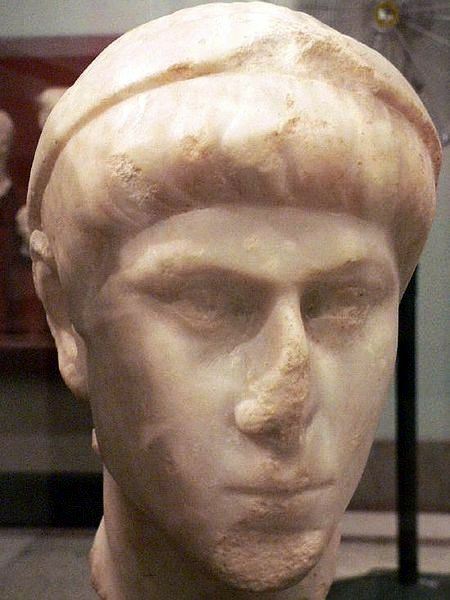 As the second son of Constantine I and Fausta, he ascended to the throne with his brothers Constantine II and Constans upon their father's death. His brother Constans was overthrown and assassinated in 350 by the usurper Magnentius. Constantius II then defeated Magnentius to become the sole ruler of the Empire. In 351 Constantius elevated his cousin Constantius Gallus to the rank of Caesar, but had him executed three years later after receiving scathing reports of his violent and corrupt nature. In 355 Constantius promoted his last surviving cousin, Julian, to the rank of Caesar. Julian claimed the rank of Augustus in 360, leading to war between the two. However, Constantius became ill and died late in 361, after naming Julian as his successor. (6) Constantius II 348-350 A.D.
(8) Constantius II 347-355 A.D. Reverse: FEL TEMP TEMP RE-PARATIO, soldier standing left, spearing a fallen horseman who is wearing a Phrygian helmet, reaching backwards. D in left field. Mintmark TCON. (9) Constantius II 348-351 A.D.
(10) Constantius II 324-361 A.D.
(11) Constantius II 348-350 A.D.
(12) Constantius II 347-348 A.D.